Would you like to help select the 2019 Girl Scout Cookie Program rewards? Click here to cast your vote TODAY for your favorites. Voting ends midnight on July 15, 2018. Draw a flip flop at checkout and receive a 10 percent, 15 percent, or 20 percent discount off the entire purchase. With a $35 purchase, you will receive a FREE flip flop patch. May not be combined with any other offer. Receive a 50 percent discount off the clearance rack. May not be combined with any other offer. While supplies last. Due to the process of archiving the current membership year, the Volunteer Toolkit will undergo a maintenance period starting at 8 p.m. on Friday, June 29. Users will not be able to access any features until the site returns the week of July 9th. If you have not submitted your financial reports, do so by Thursday, June 28. Open to Girl Scout Seniors and Ambassadors. Attend this training and learn how to successfully plan and carry out a Gold Award project. Attend one of the Girl Scout Program Basics, Part II classes where you will learn how to teach your girls how to plan their year and their troop meetings. Learn the basic understanding of the responsibilities of a canoe instructor for taking girls out canoeing on our camp properties. Does your troop have a first-aider? Has your first-aider's certification expired and now needs to attend an upcoming class? If so, register for a classroom First Aid/CPR/AED training today by visiting the EMTA Enterprises website. Haven't renewed your membership for 2019 yet? Renew today! Time is running out, get your brick TODAY! Your service to the Girl Scouts of the Colonial Coast is part of the ground work that is making every girl in our community a G.I.R.L. (Go-getter. Innovator. Risk-taker. Leader.) Your dedication to give time will leave a long-lasting impression on the girls in your service unit, and now your impression can be ‘set in stone’ at A Place for Girls. Commemorate your volunteer time with the purchase of a Brick. Click here for additional information and the order form. The Brick Dedication ceremony will take place on August 16 at 4:30 p.m. Celebrate with us as we build a path to the future for all our G.I.R.L.s! Open to all Girl Scout volunteers. Volunteers are invited to attend this year's Volunteer Kick Off. Spend the day celebrating with fellow volunteers and GSCCC staff. Attend THREE workshops of your choice, find out what's new, network with other volunteers, and get energized for a new Girl Scouting year. Academy runs June 25th - July 20th, 2018 Monday Through Friday, 9 a.m. to 4 p.m.
You are invited to participate in the 2018 CSET Health and Science Summer STEAM Academy! The Program will be held June 25, 2018 – July 20, 2018, from 8:45 a.m. – 4:00 p.m. daily. The purpose of this program is to encourage student interest in the sciences and health sciences, provide role models and networking opportunities, and provide reinforcement activities to middle and high school science courses. This is an excellent opportunity for students to explore careers in the sciences while gaining valuable experience in laboratories associated with their science courses. The Academy begins on Monday, June 25, 2018 between 8:30 a.m. and 8:45 a.m. in Woods Science Building at Norfolk State University. Middle school students should meet in room 103 and high school students should meet in room 104. There will be no parent orientation. Activities will begin promptly at 9:00 a.m. Lunch will be provided. The Volunteer Toolkit will be unavailable due to scheduled maintenance beginning at approximately 8 p.m. on Friday, June 15, 2018, and ending no later than Sunday, June 17. Due to the process of archiving the current membership year, the Volunteer Toolkit will undergo an additional maintenance period starting at 8 p.m. on Friday, June 29. Users will not be able to access any features until the site returns the week of July 9th. Free event for service unit volunteer leadership team members. Service unit volunteer leadership team members are invited to attend this conference especially for them. During this conference, you will receive your position training as well as information on media and communications. Find out what's new for the upcoming year and enjoy lunch on us. 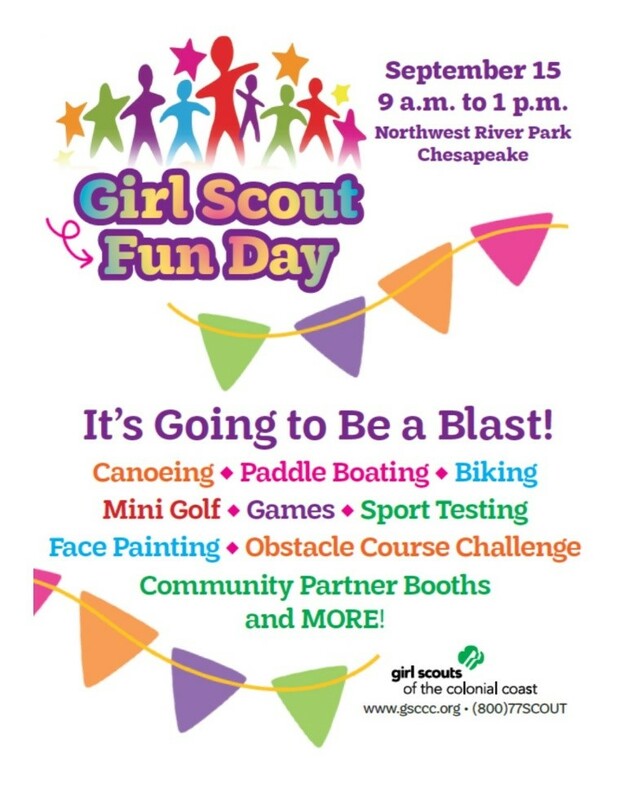 Girl Scout Fun Day is coming this September! Registration is open to any girl and/or adult who has registered for the 2019 membership year. Cost to attend is $10 per person and must be paid at the time of registration to guarantee a spot. This event promises to be super-duper fun but capacity is limited, so register soon! Event registration closes on July 1 or until full capacity. Haven't renewed your membership for 2019 yet? 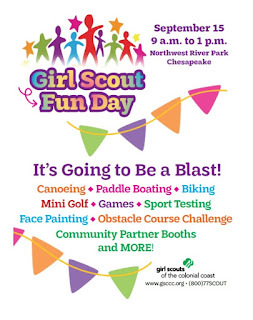 Renew your membership today and then you'll be eligible to register for Girl Scout Fun Day as well! Girls will join their fellow teen Girl Scouts for this leadership development course, led by girls! Activities in this fun, exciting, and action-packed four-day course will provide teen girls with leadership skills and experiences needed to become effective leaders in their communities. Parents will be invited to a graduation event. Registration fee includes all course materials, program uniform, event patch, certificate, and all-inclusive lodging for 4 days. Spaces are limited. 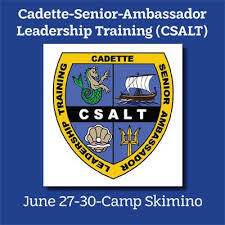 Contact csaltcoursedirector@gmail.com or call 757-620-7294 with event questions. LEAD Hampton Roads is currently seeking applicants for the 2018 eXcel Leadership Academy that will occur July 17-20 | 9 AM-5 PM. LEAD Hampton Roads is proud to announce the 2018 eXcel Leadership Academy, a summer youth leadership program designed to develop critical career and life skills while building an appreciation of our region and its many opportunities. The experience provides training and connections that assist students in accelerating their high school success and in building strong resumes and college applications. For the Class of 2018, we are seeking rising juniors and seniors from high schools across Hampton Roads who are passionate about preparing for their future and providing service to their community. For more information about the curriculum and mission of our programs, click here. and must be postmarked or emailed as an attachment to aepps@hrchamber.com by June 15, 2018. If you haven't already renewed your troop, now is the time! In addition to ensuring that your girls are on the path for a successful year of adventure, learning and leadership skill building, you also have the chance to win a pretty amazing incentive. Have you ever heard of a little place called Great Wolf Lodge? All troops who renew 90 percent of their girls plus two adults by midnight on June 4th will be entered into a drawing for a chance to win a $500 gift card to Great Wolf Lodge. How amazing is that?! As a reminder, June 9 is the last Saturday the Chesapeake retail shop will be open until September 1. Monday to Thursday: 8:30 a.m.-5 p.m.